This is the Green Line update for December 2018, but I with the new funding announcement last week that replaces MSI funding in 2022, this means that there is a funding path for Phase 2 of the Green Line that I am looking at. I am excited for this to start construction in 2020. There is still much to do, and the Green Line team have been working hard. Phase 2 will serve Ward 3 and Ward 4 residents. The Green Line team has been busy presenting to City Council committees this week. We presented two update reports, one on City Shaping and another on the overall project which will be presented at committee today. We also requested two deferrals on future staging and financing. These reports will be back to committee in early 2019. Stay tuned! 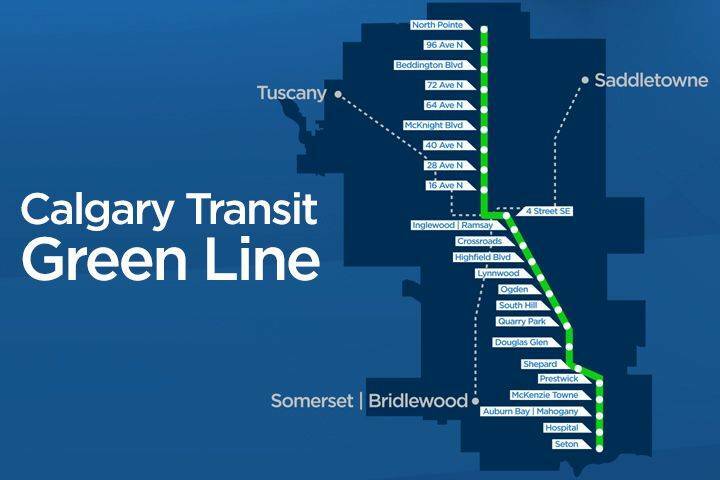 The City is committed to delivering Stage 1 of the Green Line, from 16 Avenue N to 126 Avenue S.E. within $5 billion, by 2026, prioritizing safety, quality and cost. The project team continues to work on what is called a Constructability Review. The goal of the review is to maintain Council approved objectives while balancing quality, cost and planning the safest work methods. The review is focused on identifying and planning for costs and major risks associated with Stage 1, with particular attention to the proposed 4-kilometre tunnel through the Centre City and Beltline and construction of the underground stations. This update to Council also includes information on when The City plans to release a Request for Qualifications (RFQ) to industry for the main construction contract, and the status of funding for the Green Line. Building a great city and enhancing the quality of life of Calgarians remains an important priority for the Green Line project. A people-focused approach will ensure a transit system that enhances the daily lives of Calgarians. Early investment in City Shaping will benefit citizens who use transit and live in the city for generations to come. The Green Line team was at Committee Wednesday to share an update on a City Shaping Framework that will enhance the community experience along the Green Line and improve access to community and cultural destinations at and around station areas. Don’t forget, you can watch all Council and Committee meetings live on Calgary.ca and review past meetings here! Many Calgarians already know The City has begun Green Line construction to prepare the right of way for the main construction of track and stations, set to start in 2020. These ongoing construction projects include things like land preparation and utility relocation. To date there are approximately 15 projects ongoing or completed to help prepare for major Green Line construction. These projects are an additional benefit of a major project like Green Line. Upgrading old utilities now means we won’t have to do it in future and remediating old landfill sites opens up that space for new uses! For more information on ongoing or upcoming Green Line construction visit Calgary.ca/GreenLine.